The Westleton Crown is an Inn for all seasons. In the spring and summer the cleverly terraced and well nurtured gardens are a seamless extension to the restaurant and in the winter there are few better places to cosy up beside the roaring ﬁre in the ever welcoming bar following a bracing heathland walk across some of the most stunning Suﬀolk landscape that The Crown is blessed to have on its doorstep. On this occasion, a perfect day in early October, we’d chosen to visit at lunch time to review the new menu and meet new Head Chef Robert Mace. With a clear blue sky and temperatures in the high teens the garden terraces – a riot of autumnal colour and laden with fruiting trees – were ﬁlled with casual diners making the most of the unseasonally good weather. The restaurant practically glistened in the soon to be fading sun and we settled at a table near the window with a glass of refreshing Adnams Spindrift while we studied the menus. I always enjoy those moments when looking at the menu as it gives a chance to drink in the atmosphere of a place while mixing and matching dish choices in imaginary quick ﬁre ‘description auditions’. The Crown achieves a perfect blend for me of feeling special – a treat - but retains a relaxing and casual quality that just makes you want to settle in and stay. Although sometimes you are lucky enough to ‘stumble’ on a great venue it is generally the reputation of a place which drives an initial visit and after that, once one’s own opinions have been formed, it’s the hope that every visit be as good the last. 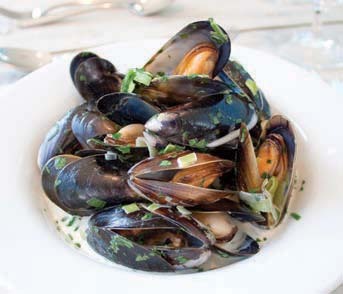 Over the last few years The Westleton Crown, under previous Head Chef Richard Bargewell, has gained an enviable reputation as a consistently excellent culinary destination with hearty yet sophisticated food. So, with a change lead in the kitchen, we were intrigued to see if there would be a noticeable diﬀerence to the menu or the experience. From our initial look at the menu it was apparent that the good reputation and character of The Crown are safe in his hands. With an impressive pedigree and extensive local knowledge Robert has developed a menu that continues to hold true to the values we’ve grown to expect with every element created from scratch using only the very best locally sourced and ethically sound ingredients. His ethos, and in fact the ethos of the whole Crown team, is that they want to build on the reputation of The Westleton Crown making sure that each visit is not just as good as your last but hopefully even better. It was clear from our conversation with Robert that ‘local’ is key and that shone through immediately. Visiting as we were in a month ending in ‘er’ (and supposedly the best for shellﬁsh) steamed Simpers Deben mussels leapt straight from the menu and I could have saved my husband the bother of reading through the other rather enticing choices – it was clear he wouldn’t be able to resist. Cooked in a leek and cream sauce ﬁnished with Aspall cyder the aroma from the dish alone gave me a pang of the dreaded food envy. Mopping up the juices from his bowl with light and ﬂuﬀy rosemary and sea salt focaccia he certainly resembled the cat who’d got the cream! I found the remaining starter choices equally inviting and after much deliberation it came down to oak smoked chicken breast with sage and onion slaw (what a clever idea! ), seared scallops with cauliﬂower purée and onion bhaji or the eventual winner – soy and chilli braised pork cheek, wasabi mash, sesame, ginger and coriander. This zingy concoction truly demonstrated Robert’s belief that respect for using as much of any butchered animal as possible is paramount with the slowly cooked cheek meat melting in the mouth. We switched tacks when it came to our main meals with the ﬁsh dishes competing for my vote while Mr R was in meat-loving heaven. 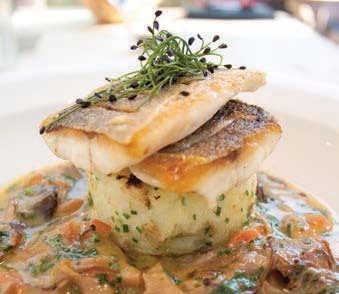 I’d seen an impressive plate of ﬁsh and chips, complete with jalapeno tartare sauce and pease pudding, pass us en route to another table and was certainly tempted but decided instead on a rich and ﬂavoursome combination of pan fried sea bass ﬁllet, herb potato cake and wild mushroom fricassée. The crisply seared skin of the ﬁsh was a perfect textural contrast from its buttery river set high on an island of ﬂuﬀy potato, neatly bringing the dish together. Across the table it was the battle of the heavy weights – braised Blythburgh pork belly, ham hock and mustard croquette with braised greens all in an Aspall cyder sauce, sure to deliver all it promised, or the seasonal game choice of roast Bunwell Wood partridge. Said bird duly arrived with a quite wondrous root vegetable gratin that looked as though you’d need an art degree to recreate it and alongside the red cabbage some sweet pieces of quince. Declared a winning combination you really can’t beat seasonal local produce. At this stage I should add that The Westleton Crown is one of the few pubs or restaurants I’ve visited oﬀering a separate vegetarian menu. With at least three starters and three main courses the curse of the ever present mushroom risotto, which seems to have become the vegetarian staple, is banished and a collection of well thought out choices, again using Suﬀolk’s best, supersede it. I know, it was lunch time – and we’d already indulged in two courses – but frankly it would have been rude not to sample the desserts. The autumnal option of steamed Bramley apple sponge pudding with blackberry compote and crumble & custard ice cream was an obvious front runner and my husband described the pudding as ‘surprisingly light’ infused with sweet apple ﬂavour throughout and oﬀset perfectly by the sharp berry accompaniment. My classic English dessert plate; treacle tart with clotted cream, triﬂe and a baked rice pudding (all in miniature of course) were a revelation. I wouldn’t have chosen a whole portion of any one of them after such a substantial meal but the idea of a little of each was too good to miss and rounded oﬀ the entire experience beautifully. If only we could have stayed. As the afternoon meandered on and we sipped at our coﬀees I could have happily moved through to the cosy bar. Instead, with promises to ourselves that next time we’d make a weekend of it, we headed home feeling happily full and with another great meal at The Crown enjoyed. In addition to the main menu, every Wednesday through to the end of March, enjoy the delicious ‘Winter Warming Wednesdays’ set menu, for lunch or dinner, from £14.95 (two courses) or £18.95 (three courses).